We finally got our new car — well, small SUV. 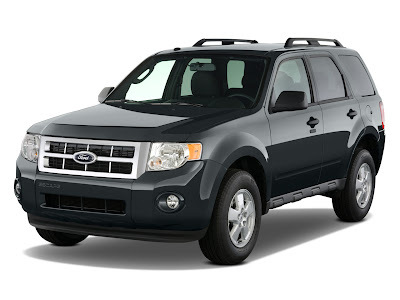 It’s a 2009 Ford Escape XLS, in black, just like Mr. Saver wanted. It was also one of only two of this base model trim available in black in the entire state (also counting nearby upstate NY and New York City). There was one in Belmar but it was sold before we could even try to get it, but we were able to get this one from Netcong. It wasn’t easy, though. Our dealer, who was recommended to us by my father-in-law, kind of screwed us around with this whole process. We knew what we wanted going in. Mr. Saver only wanted black — any other color wasn’t an option — the XLS trim and front-wheel drive. They located one in Syosset, N.Y., but never actually checked with that dealership to see if they would give up the car for a dealer swap. When my dealer guys couldn’t get in touch with them (they weren’t returning phone calls, etc. ), my obnoxious journalist personality kicked in, and *I* made the call. Got someone right away, who said they weren’t doing dealer swaps anymore and then invited me out there to buy the car from them. I declined and was really unhappy about the situation. When our dealer called back, I told the Ford manager what I did, and he was incredulous that they “lied to him.” Not sure what he meant by that, seeing as he never actually got any answer of any kind. Then came the great black Escape XLS search. I used the dealer inventory search on www.fordvehicles.com to try to locate another vehicle. Found one in Belmar, told our dealer, who said they had sold that one already. The only other one “nearby” was the one in Netcong, but it was all-wheel drive and about $1,400 more with tax. I tried to talk Mr. Saver into getting the vehicle in another color, but to no avail. So we sucked it up and took this one. We got 0% financing over 60 months and the payment is a bit more than his last lease, but at least it will be ours. I suppose it will be helpful in bad weather, too, since it’s full-time AWD. He put a whopping 19,000 miles on his last car over 39 months, so we won’t wear it out too quickly, I hope. Can’t wait to drive it — hubby drove it home last night and took it to work today, so I haven’t actually gotten behind the wheel yet. I love new-car smell!